March 1985 - Julian embarks on his debut concert tour which is an instant sell-out. The headlining itinerary marks his first live performances. Joining Julian on stage are: Justin Clayton (guitar), Carlos Morales (guitar), Carmine Rojas (bass guitar), Chuck Kentis (keyboards), Frank Elmo (saxophone), and Alan Childs (drums). In addition to selections from Valotte, Julian's first concerts feature such rock 'n' roll classics as Stand By Me, Slippin' and Slidin', and Day Tripper. 10 - 22 March 1985 - The band rehearses for the upcoming tour in Dallas, Texas. 23 & 24 March 1985 - The tour opens at the Majestic Theatre in San Antonio, Texas to rave reviews. As The San Antonio Light states: "Julian Lennon's first U.S. tour began with a seamless San Antonio triumph last night, a powerful concert debut that left little doubt the son of the late John Lennon is his own man...The crowd in the sold-out Majestic Theatre loved everything, embracing Lennon and his powerful band...When he and his band bowed to a deafening ovation, it was clear in his smile that he knew he'd arrived on his own terms." 26 March 1985 - Julian is the guest VJ on MTV. 29 March 1985 - Julian performs at the Louisiana State University Assembly Hall in Baton Rouge, Louisiana. 31 March 1985 - Julian performs at the Jai Alai Fronton in Tampa, Florida playing every song from Valotte as well as Stand By Me, Slippin' and Slidin', and Day Tripper. 1 & 2 April 1985 - Julian performs at the Sunrise Theatre in Sunrise, Florida. 4 April 1985 - Julian performs at the Chrysler Hall in Norfolk, Virginia. 5 April 1985 - Julian performs at the Constitution Hall in Washington, D.C.
6 April 1985 - Julian performs at the Syria Mosque in Pittsburgh, Pennsylvania. 8 - 10 April 1985 - Julian performs sell out concerts at New York's Beacon Theatre...backed by Justin Clayton and Carlton Morales on guitars; Carmine Rojas on bass; Chuck Kentis on synthesizer, keyboards and vocals; Frank Elmo on saxophone and Alan Childs on drums. The fans didn't forget his birthday either... they showered the stage with shouts of "Happy Birthday," flowers, cards, gifts and even an inflatable birthday cake complete with candles. After the show on the 8th, Julian headed to Regine's to celebrate his birthday with a chocolate cake. 12 & 13 April 1985 - Julian performs at the Tower Theater in Philadelphia, Pennsylvania. 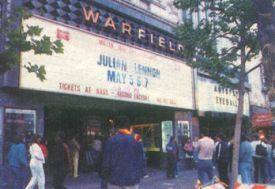 17 April 1985 - Julian performs at the Orpheum Theater in Boston. Massachusetts. 18 & 19 April 1985 - Julian performs at Massey Hall in Toronto, Canada. 20 April 1985 - Julian performs at the Landmark Theater in Syracuse, New York. 22 April 1985 - Julian performs at the Public Music Hall in Cleveland, Ohio. 23 April 1985 -Julian performs at the Fox Theater in Detroit, Michigan. 24 & 25 April 1985 - Julian performs at the Auditorium Theater in Chicago, Illinois. 27 April 1985 - Julian performs at the Dallas Convention Center in Dallas, Texas.... Say You're Wrong debuts on the Billboards Top 40. It spends 8 weeks on the Top 40 charts, peaking at #21. 29 April 1985 - Julian performs at the Phoenix Symphony Hall in Phoenix, Arizona. 1 - 3 May 1985 - Julian performs at the Universal Amphitheater in Los Angeles, California. 10 May 1985 - Julian's first North American tour winds up with his performance at the Waikiki Shell in Honolulu, Hawaii... then it's on to Australia and Japan for a string of dates running into early June. July 1985 - Julian's Valotte video is nominated for Best Video by a New Artist by MTV. 13 July 1985 - Julian participates in Live Aid, a benefit for starving people of the world. 13 September 1985 - At the MTV Music Awards Julian's is nominated for Best New Artist with Too Late For Goodbyes but loses to Til Tuesday's Voices Carry. Later in the show Bryan Adams and Julian show the world how a Canadian and a Brit do the choreography and present the award for best Choreography to David Atkins for his work on Elton John's Sad Songs Say So Much. 23 October 1985 - Julian is awarded the ASCAP Award for Publishing. The award is accepted by Julian's mother Cynthia in Julian's absence. 25 November 1985 - Julian's cover of Dave Clark's Because is releases as a single in the UK. The song appears on Dave Clarks' musical Time. 28 November 1985 - Stand By me: A Portrait of Julian Lennon is released on MCA Home Video. This 58 min/Color Revealing Portrait of Julian Lennon includes live performances, offstage moments, and intimate reflections on his life, music, and heritage. Filmed by Martin Lewis during Julian's first tour. 6 December 1985 - Julian is interviewed on ABC's Good Morning America.